The furniture japanese calls to serenity, therefore, to meditation due to its decorative appearance and its originality. 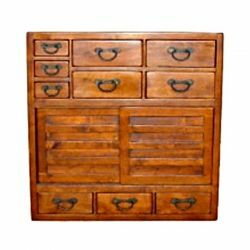 The furniture japan such as tansu or shoba find their place in tight spaces and that is what we are looking for to furnish our small apartment. They are, above all, practical and sober. This style of asian décor also brings a touch of elegance in any interior, in addition to the exotic. 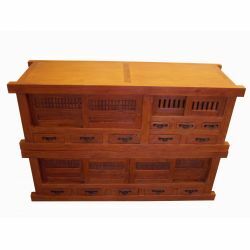 In fact, the furniture japanese are full of charming, often brilliant, and very finely worked. The furniture japanese is designed as a work of art in its own right. Furniture Japanese There are 8 products. Furniture japanese-japanese tea set made in paulownia woodDimensions: L30 x P15 x H35 cm. 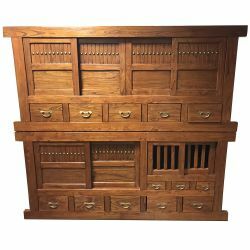 Furniture japanese choba tansu japanese made of larch wood recycled.Dimensions: L110 x P45 x H90 cmBecause of their number, location and position of doors and sliding drawers, the modules of this large mizuya have different functionality, leaving you the choice of the facility. Furniture japanese mizuya made of solid elmDimensions: L120 x P50 x H170 cmBecause of their number, location and position of doors and sliding drawers, the modules of this large mizuya have different functionality, leaving you the choice of the facility. Furniture japanese mizuyaDimensions: L135 x P45 x H90 cmBecause of their number, location and position of doors and sliding drawers, the modules of this large mizuya have different functionality, leaving you the choice of the facility. Furniture japanese Mizuya.Dimensions: L200 x P50 x H180 cmBecause of their number, location and position of doors and sliding drawers, the modules of this large mizuya have different functionality, leaving you the choice of the facility.